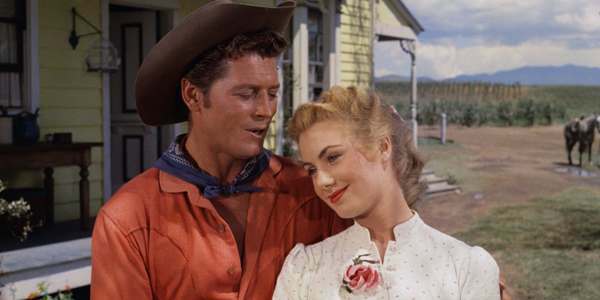 Curly (Gordon MacRae) loves Laurey (Shirley Jones), but pretends he doesn’t. Laurey loves him right back but is too stubborn to say so. Jud Fry (Rod Steiger) the farmhand lusts for Laurey too. Laurey’s friend Ado Annie (Gloria Grahame) is betrothed to Will Parker (Gene Nelson), but he can’t get Annie’s father’s permission until he has at least $50 to his name. Whilst Will has been earning the money in Kansas City, Annie has blossomed somewhat as a woman, and found herself with plenty of suitors, believing her most recent conquest, travelling salesman Ali Hakim (Eddie Albert), wants her for his wife. Laurey’s Aunt Eller (Charlotte Greenwood) watches everything with a wry smile and a disapproving eye, making remarks that aren’t funny, but which everyone in the film laughs raucously at anyway. Also: everyone sings. As a rule I don’t like musicals. Or at least, that’s what I tell people, because I’m a heterosexual man in my late 20s and we’re not supposed to be into that kind of thing. However, it’s all a lie. The truth is, as I discovered recently with horror movies when watching The Texas Chainsaw Massacre (yep, I’m somehow comparing that toOklahoma! ), the problem is I haven’t seen all that many, and the general consensus is that it’s uncool to like them, so I assume I won’t either. There are some I have seen and not liked – The Sound of Music springs to mind, which I found beyond boring and downright arduous to sit through, and I’ve seen Grease far too many times to be able to tolerate it again – but there are far more that I actually like, not even counting the Disney ones I grew up with, which are out-and-out classics like The Lion King and Beauty and the Beast. West Side Story is a film I didn’t expect to like at all, as is Seven Brides for Seven Brothers, but I found my foot was a-tapping and occasionally I was a-singing along, despite the frankly ludicrous plots and horrible performances that both of those films contain. Oklahoma!, on the other hand, is just not good. To begin with, pretty much every character behaves in an infuriating manner. Our lead couple are Curly and Laurey, who clearly have an established relationship of both fancying the other, but neither one wishing to make the first move for fear of losing face in front of the other. It seems that if Curly were to ask Laurey out he would have lost some inane implied competition between them, so they are destined to be miserable and apart for the rest of their lyrical lives. Similarly, Ado Annie and Will Parker are utter fools, whose constant misinterpreting of every situation around them may cause comedic scenarios, but always at their expense because they’re so damn stupid. Jud Fry is a caricature of the stoic, slow lout and Aunt Eller is a generically spry little old lady. The only character I had any approval of was Ali Hakim, mainly because his storyline of unwittingly becoming engaged without ever proposing was amusing to behold, as were his futile attempts to extract himself from the situation, which were thwarted at every turn by the aforementioned dumb folk surrounding him. It’s a shame that he’s such a creepy guy though – he’s very excited now that Laurey is all grown up, considering she was just a child the last time he was in town, and at one point he makes no attempts to hide his plans to watch her and Annie getting undressed. OK, so the characters are a bit dippy, but what do you expect from people who spontaneously burst into song sometimes multiple times within the same scene? Ah yes, the songs. Going in, there was only one song I knew was in this production, that being the eponymous Oklahoma! (Where the wind comes sweeping down the plain! ), because they sing a bit of it in Twister (a much better film also set in this state, but which would be boring to read my review of because it’d be nothing but nostalgic gushing, specifically over Philip Seymour Hoffman, and Bill Paxton’s delivery of “DEBRIS!”). I spent most of the film waiting for this song, because I think some of the lyrics are quite clever (they spell OKLAHOMA in it, it’s genius) so I was disappointed to find it right at the end of the film, leading into the credits. That’s no fault of the movie’s though. Oh What A Beautiful Morning is fine, and makes a good opening number, and I didn’t realise it had more than four lines of lyrics to it. Where everything starts to fall apart, however, is directly after this song, with Gordon MacRae’s rendition of The Surrey With The Fringe On Top, a song entirely about the method of transport Curly plans to take Laurey to the upcoming ball in. It’s terrible, and seems to go on forever. MacRae is a fine performer, so there’s that, but when Gloria Grahame screeches through I’m Just A Girl Who Can’t Say No I realised this was going to be a long film, in which I found myself gritting my teeth and bracing for the annoyance that would come every time the orchestra kicked in. There’s a couple of decent dance numbers, specifically to Kansas City (in which the location is described as being like a dream, due to containing strip clubs and a skyscraper seven storeys high) but some elements of the song called for tap dancing, which was shown on the screen by cutting off the actors’ feet, which felt like they were either cheating by not actually dancing, or being short-changed by not showing the most impressive aspect of the routine. My main problem with the film was the story, more specifically the timing of it all. The film takes place over the course of one day, which will culminate in a big celebratory dance, complete with an auction for hampers created by the womenfolk of the town/state/field. It was an era when “sundown” was a reputable time to arrange things by, despite the fact that in the scene immediately after the scheduled sunset event occurs, the sun looks pretty damn high in the sky. Also, everyone is heading to the ball, which is in such a remote location that everyone has to stop on the way at Aunt Eller’s house to freshen up, water the horses and engage in a peach-picking party. It’s all just far too silly, inconsistent and very often stupid, even for a musical. There are a few unexpected turns in the plot – at one point our hero tries to make someone commit suicide through song (“He looks like he’s asleep / It’s a shame that he won’t keep / For it’s summer and we’re running out of ice.”), only for the intended victim to take over the duet, but continue singing about his own death. Elsewhere there’s an interminably long dream sequence straight out of a David Lynch or Luis Bunuel movie, making this a sweeping musical epic with extended surrealist moments, and is therefore the worst kind of film for me imaginable, shy of inserting sporadic scenes of explicit body torture. So basically, I didn’t like this film, and not just because it’s a musical. It’s got a terrible, nonsensical story, bland songs sung by bad singers, poor attempts at humour and is far too long to boot. This entry was posted in 05/10, 1001, Choose Life, French Toast Sunday and tagged Charlotte Greenwood, Eddie Albert, Fred Zinnemann, Gene Nelson, Gloria Grahame, Gordon MacRae, Oklahoma!, Rod Steiger, Shirley Jones by jaycluitt. Bookmark the permalink. If you have children, be sure their video games are appropriate for their age.